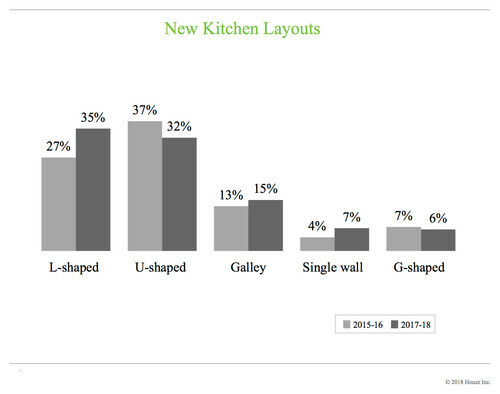 The L-shaped kitchen has nudged aside the U-shaped kitchen to become the most popular layout among U.S. homeowners changing their kitchen layout in a remodel, according to recent Houzz data. 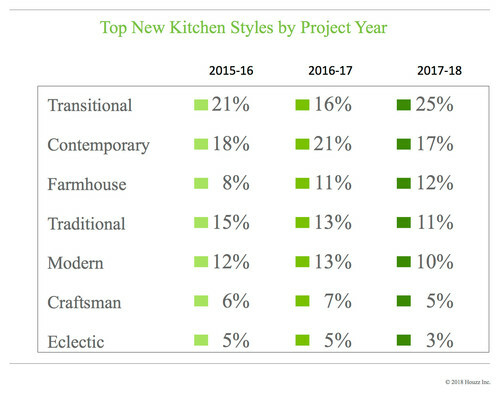 And farmhouse style has unseated traditional style for a spot in the top three kitchen design styles among remodelers. 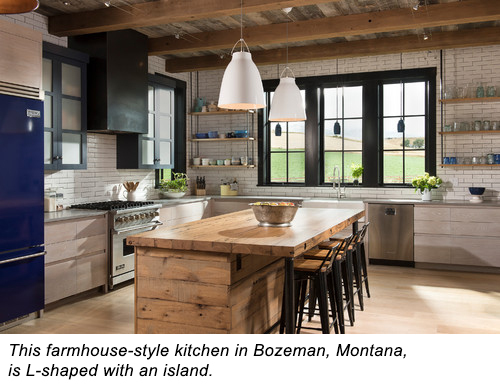 Houzz recently surveyed more than 1,700 homeowners in various stages of a kitchen renovation project as part of its 2018 U.S. Houzz Kitchen Trends Study. Among other things, the study asked the homeowners about the layouts, storage solutions and design styles they chose for their remodel. The answers offer a look at what’s popular now in American kitchens. L-shaped layouts lead the trend. Half of homeowners changed or planned to change their kitchen layout during the renovation, and of those, 35 percent chose an L-shaped layout, making that the most popular option. That’s a shift, as two years ago U-shaped was most popular among renovating homeowners who changed their kitchen layouts. G-shaped kitchens — essentially U-shaped kitchens with a peninsula added to one end of the U — were least popular, the study found. Opening up the kitchen is popular. 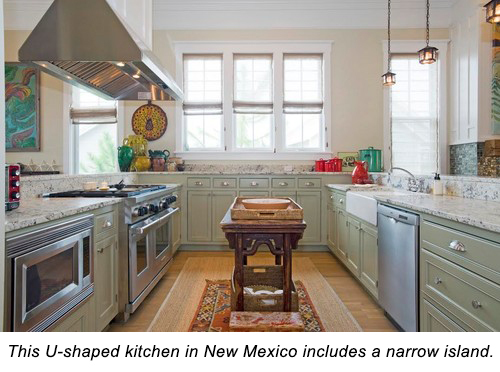 Half of renovating homeowners open their kitchens to other indoor spaces. 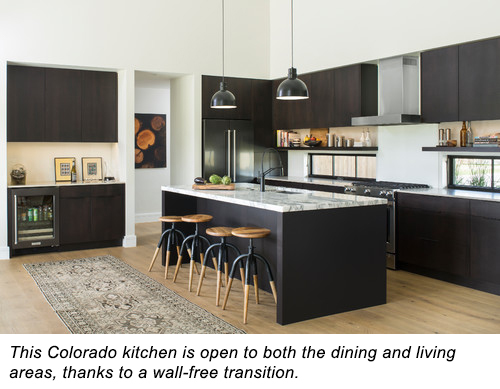 The most popular way to blend the space from the kitchen to the adjacent room is with a fully open, wall-free transition, chosen by 56 percent of those who made their kitchens more open. After that, double doors, a row of doors or a wide opening were most popular. Some crave more access to the outdoors. About 18 percent of renovating homeowners said they were opening their kitchens more to outdoor spaces. The most popular way to do so was with double doors or a row of doors. A single door was the second-most popular choice. Size. 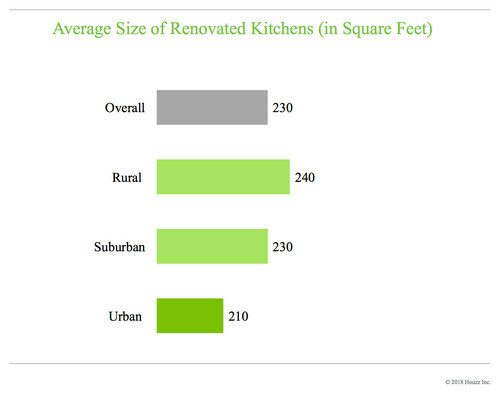 Overall, the average size of a renovated kitchen was 230 square feet, the study found, but size varies by location. 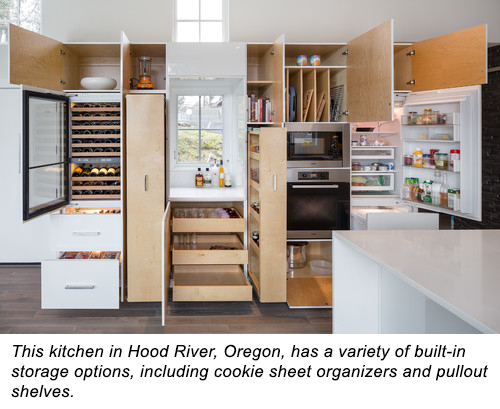 Owners of urban homes reported the smallest kitchens (210 square feet, on average), while owners of rural homes reported the largest (240 square feet). More homeowners (40 percent) reported increasing the size of their kitchens during renovation than did homeowners in the surveys for 2015-16 (36 percent) and 2016-17 (37 percent). Function matters, especially when it comes to storage. Renovating homeowners expressed both design-related priorities for their renovated kitchens and functional ones. 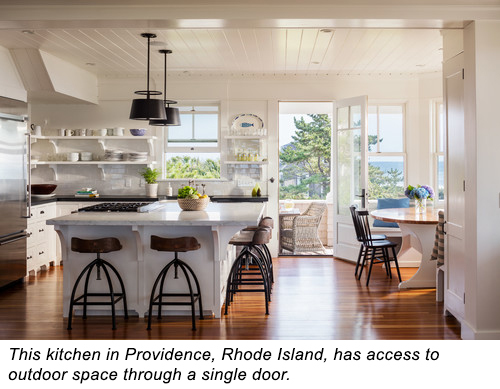 A top functional priority, cited by 63 percent of renovators, was having a kitchen in which it’s easy to store and find items. Making the list for a minority of respondents (21 percent) was a kitchen that’s easy for multiple cooks to work in. People like to corral their cookie sheets. Given that storage was a priority for so many, it isn’t surprising that many of those who upgraded their cabinets chose to include built-in storage. 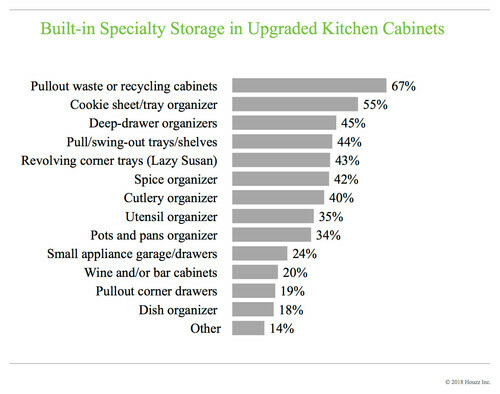 The most popular choices were pullout waste or recycling cabinets (67 percent), followed by cookie sheet or tray organizers (55 percent) and deep-drawer organizers (45 percent). Style matters too. Creating a kitchen that’s stylish and beautiful was the top priority among renovating homeowners, cited by 60 percent. And 47 percent wanted to make sure the new kitchen integrated with the rest of the home. Shift in style. A kitchen renovation is a great opportunity to change the style of your kitchen, and 87 percent of homeowners who renovated chose a style makeover. The most popular style was transitional, followed by contemporary and farmhouse. That’s a shift from two years ago, when traditional style held the No. 3 slot. The 2018 U.S. Houzz Kitchen Trends Study, fielded in September and October 2017, reflects the responses of 1,734 registered U.S. Houzz users who had completed a kitchen project in the previous 12 months, were working on one or planned to start one in the next three months. 12 Great Kitchen Styles: Which One’s for You?